I’m no food blogger. I love food and I’m a blogger, but writing about food and recipes is really not my forte. You may be wondering why in the world I am writing a food post then? Well, the thing is, as a multicultural family different cuisines are always part of the weekly rotation. One of the staple cuisines in our home is Japanese. Add to that the need to have some healthy fast food is why today I want to share with you how I use some basic Japanese staples to create some yummy meals that are perfect for on the go! A short while back I was contacted by ToSave.com and they invited me to choose a few bits from their site for review. As it happens with discount websites there are a plethora of items available from different categories but once I saw that they had some pretty cool kitchen gadgets I opted for that and placed my order. My order consisted of a DIY sushi bazooka, some lovely natural bamboo chopsticks, and a really cute 3 layer pink bento box. 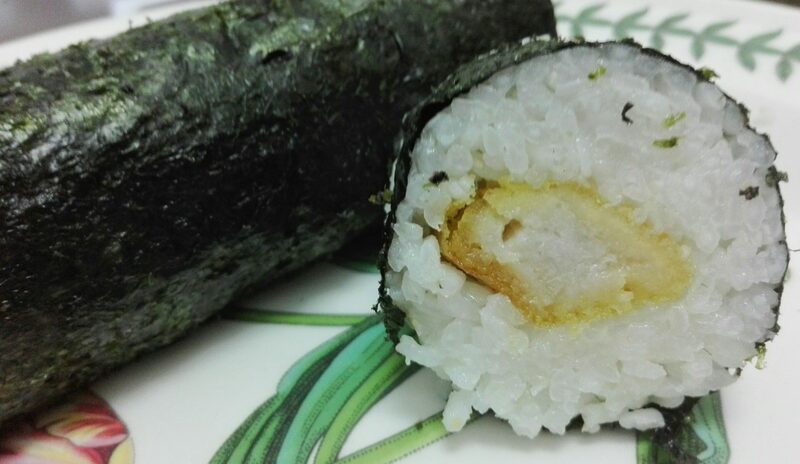 We make homemade sushi quite often, and it’s not really that difficult, but if you can find an easier way well why not? My kitchen tends to get quite messy when I use the sushi mat so I was really eager to use this strange little contraption. 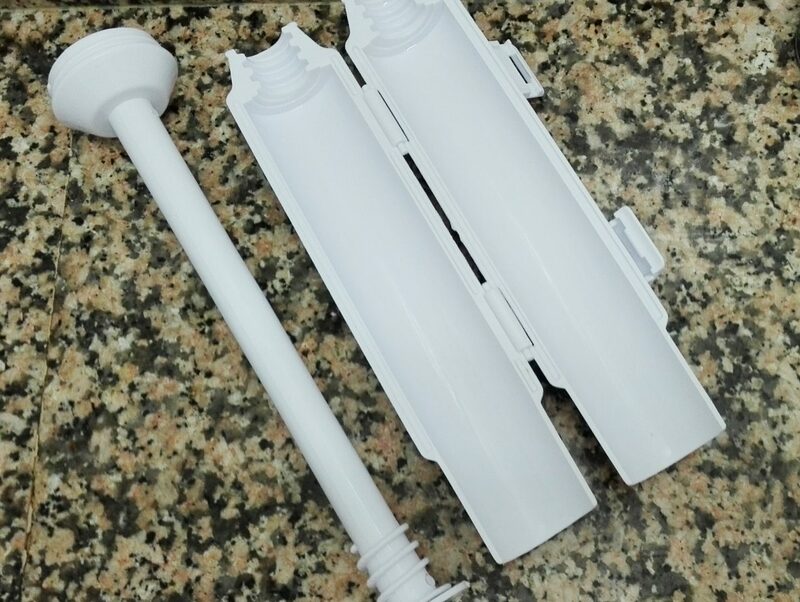 The plastic sushi bazooka is meant to simplify the process by allowing you to add rice to either side of the walls, top with your ingredients, shut, and squeeze the rolled up rice tube out. I was quite disappointed as the contraption didn’t stay shut, despite me using less and less rice and fillings to test it out. All in all the sushi bazooka is a little bit flimsy, but overall fits the bill and makes it so simple to make some delicious makizushi (rolled sushi). 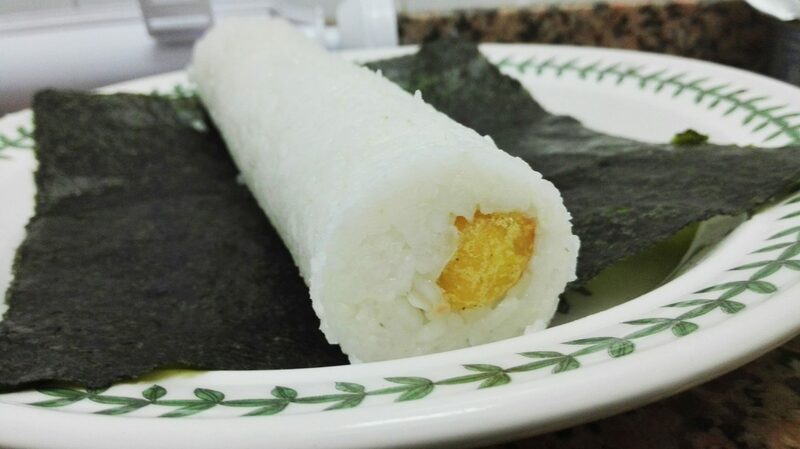 For my quick and easy makizushi all you need is boiled sticky rice, rice vinegar, the fillings of your choice, sheets of nori (seaweed) and soy sauce. 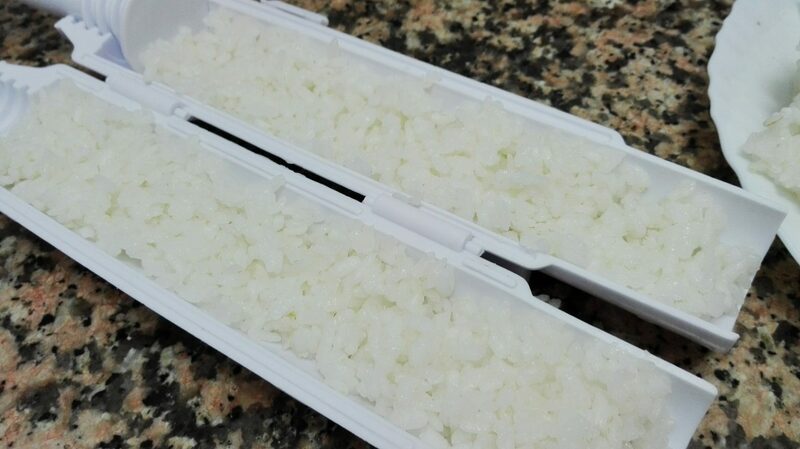 Quick tip – sushi rice is quite expensive, especially at the typical grocery shops. 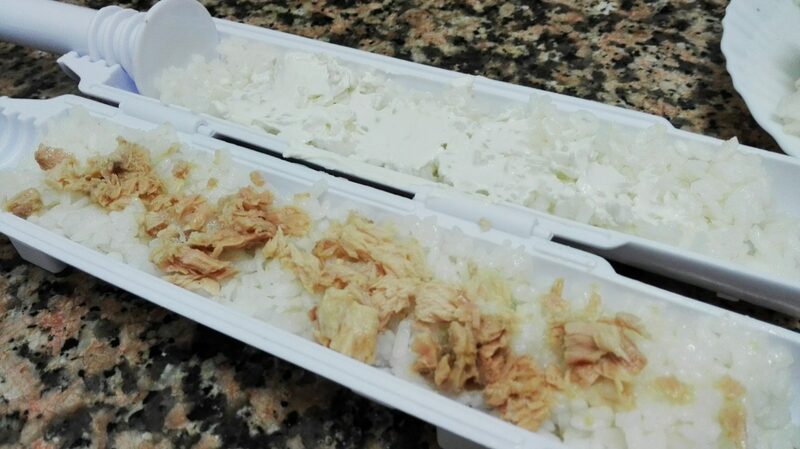 If you have an oriental food shop close to you consider that your best bet to find sushi rice at a better price. Another option is to buy pudding rice or short grain rice instead. Same effect, less cost. Making your own sushi rolls is quite simple. The first step is to rinse your rice until the water runs clear. Boil the rice until fully cooked and then set onto a plate or pan to cool. Add some rice vinegar to taste and let cool. Once the rice is cooled then you wet your hands to add the rice into the bazooka along with your fillings. Once those are in place you close and squeeze out the rice and filling and add it onto a sheet of nori. You then roll, wet the edges with water to secure it, cut into slices, and you can either serve them or pack them for lunch or serve. Another tasty treat and lunchtime staple for the Japanese are onigiris or rice balls. They are simple to make and healthier alternatives to sandwiches and the usual fast food lunchtime offerings. 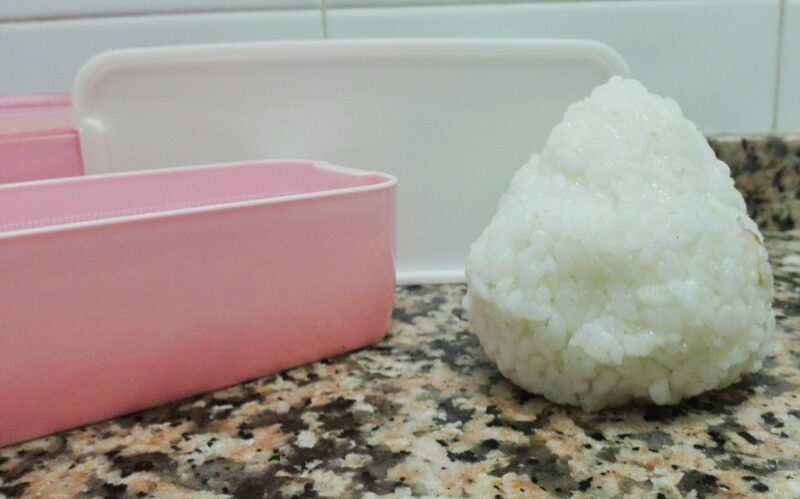 To make them you need to wet your hands to shape the rice into a ball. 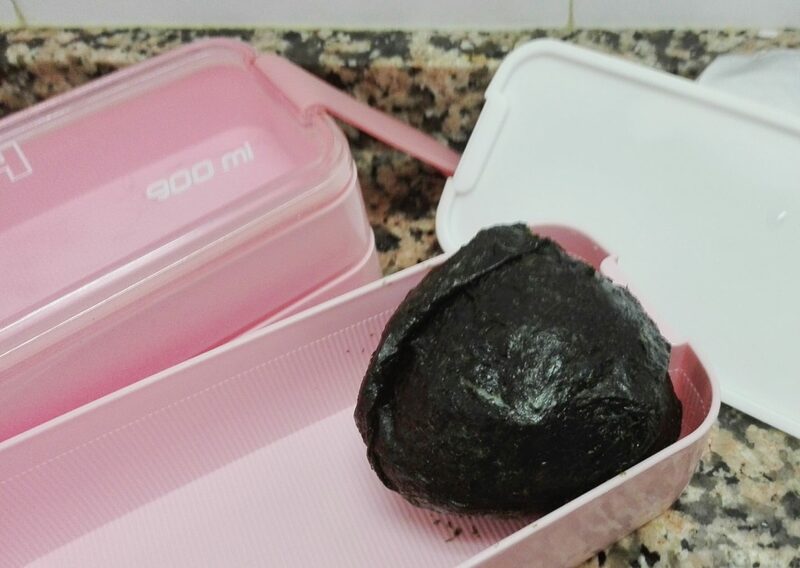 You then need to add the fillings and wet your hands to shape the nori around the onigiri and voila! The quality and offerings from the ToSave website were surprisingly good quality. The chopsticks are gorgeous, and the bento box is durable and cute. The only disappointing bit was the sushi bazooka, but by having the patience to make it work you really will cut your sushi making time in half or even less giving you some great alternatives to a quick lunch. All in all, you can find some really good discount bits on some websites, ranging from kitchen gadgets to clip in hair. Sometimes you just have to look.